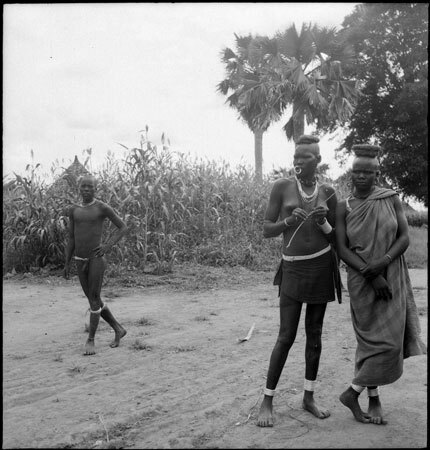 Two young Dinka women stand on a path near a homestead to the right of frame, one wearing a body cloth and fibre head carrying ring, the other with a loop lip ornament. A male youth looks on the the left of frame. Morton, Chris. "Dinka girls and youth" Southern Sudan Project (in development). 03 Jan. 2006. Pitt Rivers Museum. <http://southernsudan.prm.ox.ac.uk/details/2005.51.106.1/>.